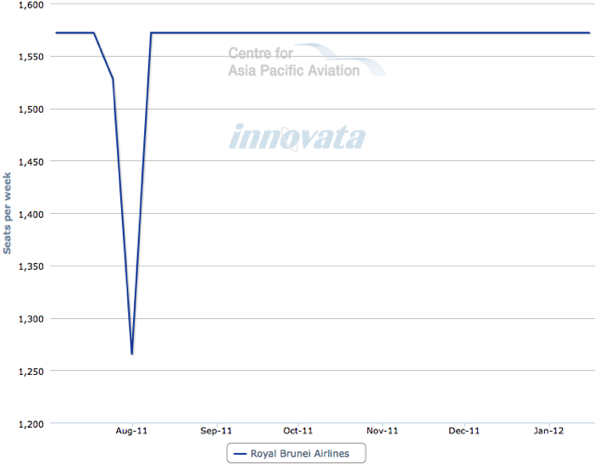 Royal Brunei Airlines (RBA) stated it is “going back to its roots" with a plan to focus on regional hub operations as it seeks to stay competitive in a “challenging” environment. The carrier noted that the financial performance of the airline, particularly in its long-haul operations, has "deteriorated to a point where the existing network is simply not sustainable in its current form". "Unfortunately, the only choice for RBA is to face up to the fact that change is unavoidable to ensure the very survival of the airline," the carrier's statement said. As part of this restructure, the carrier, as announced in Jun-2011, will suspend five international routes from Oct-2011 “to ensure the very survival” of the carrier. Services affected will include services to Auckland, Brisbane, Perth, Ho Chi Minh and Kuching, all of which are monopoly routes, with the carrier stating it has been "heavily subsidising" long-haul traffic on the routes. Following the route suspension, the carrier will instead focus on regional traffic and maintain only the long-haul routes that are consistent with the airline’s long-term objectives. 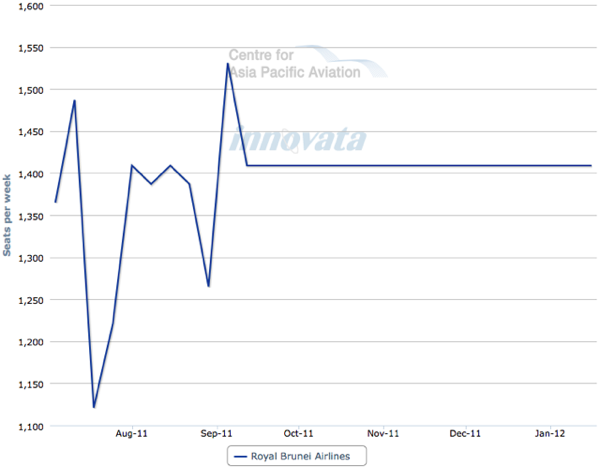 Ultimately, the government of Brunei has come to the conclusion that the cost of continuing to serve the airline’s unprofitable routes is considerably more than the economic benefits the airline or country would receive in return for keeping them open. 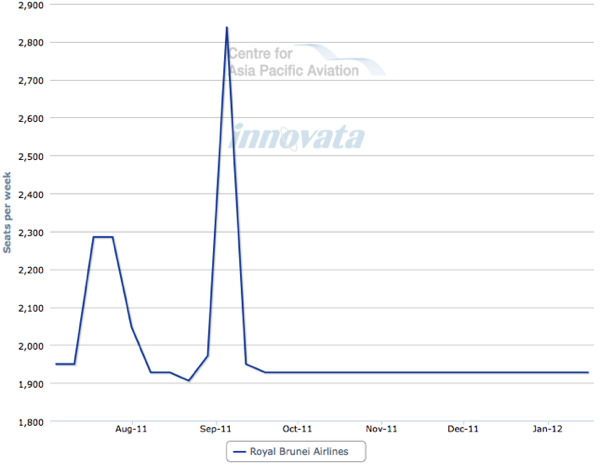 The issues that RBA is having with its over-reliance on transfer traffic also highlights the challenges that Brunei Airport, which is highly dependent on Royal Brunei Airlines, has as a transfer point. For a carrier that operates just 18 routes, the elimination of five routes marks a considerable shrinking of its network. However, the reductions are necessary for the carrier, which has suffered heavily throughout the global financial crisis and amid rising fuel prices. The carrier stated the combination of these two factors has “undermined” the airline’s position in the market and has forced it to re-examine its business model and structure in order to stay competitive. The carrier also noted the traditional "kangaroo route" between the UK and Australasia, on which RBA has depended so heavily, has become ultra competitive in recent years, especially in the face of a sharp growth in capacity from the Middle East carriers. The carrier also noted that no more than 9% of the traffic on long-haul routes either originates in Brunei or ends in Brunei. The rest simply transit Brunei and offer “little in the way of economic activity to the nation”. Based on this data, the carrier noted that it “has become impossible to justify the continuation of the route network in its entirety, where RBA is effectively providing subsidies to over 90% of the traffic while creating little or no economic value either for the airline or the country”. 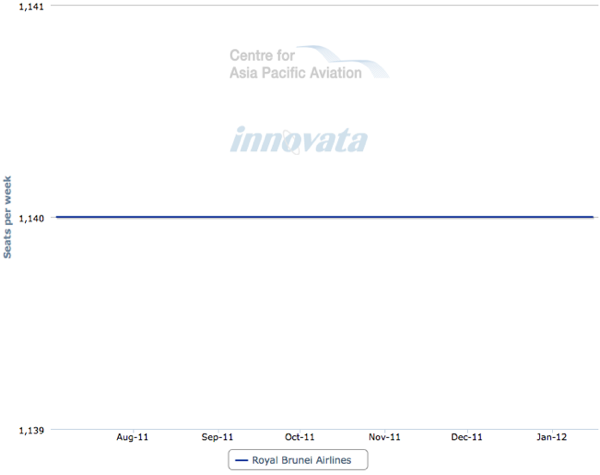 The carrier continued: “Compare that with 75% of all regional passengers who are based in or visiting Brunei and it is clear why RBA must focus on the regional market. In summary, to continue to serve the routes that have been suspended would cost RBA (and Brunei) far more than the economic benefit the airline or country would receive in return for keeping these routes open”. The same is true for freight. The carrier stated it was initially concerned that the suspension of long-haul would hurt the supply network for goods to arrive for local consumption. However, the carrier noted that daily connections via regional hubs would be a suitable alternative. 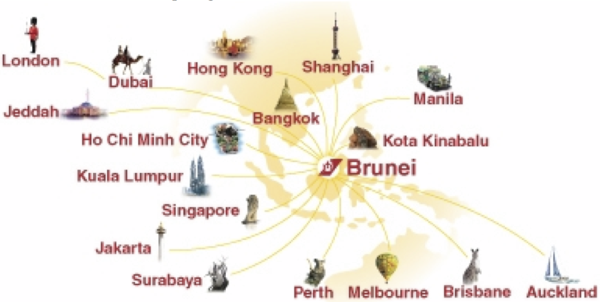 Of the 17 routes RBA operates from its Bandar Seri Begawan Brunei International Airport hub, 14 are monopoly routes, one is a duopoly route and two are served by only two other carriers. All five routes that the carrier is cancelling are also monopoly routes. However, despite this position, the carrier has not been able to charge at a level conducive of profitability. Instead, the carrier has been heavily discounting to compete with other airlines and airports which over more direct services and an enhanced in-flight product. 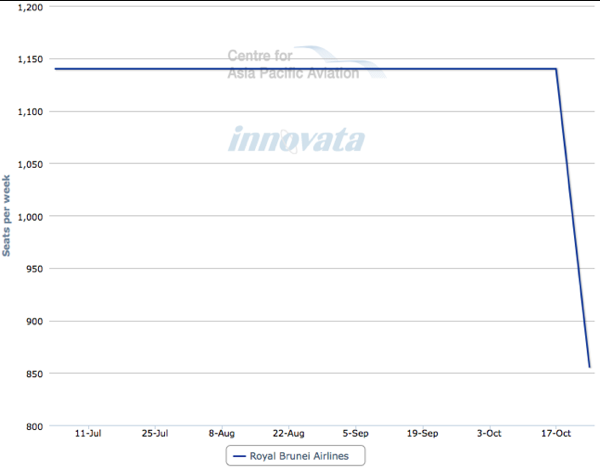 Royal Brunei Airlines, the country’s flag carrier, was established on 18-Nov-1974 as an independent corporation wholly owned by the government of Brunei Darussalam. Since its establishment in 1974, RBA has focussed, as tasked by the government, on enhancing connectivity and economic activity for the country by the provision of competitively priced flights to destinations in Southeast Asia and internationally. With a modest beginning in regional air travel with regional routes to the airline expanded over the years to include long-haul destinations in the UK, Middle East and Australia, among others. The carrier’s network initially included Singapore, Hong Kong, Kota Kinabalu and Kuching in the first years of operation, expanding to include Manila (1976) and Bangkok (1977) within the first three years. Following the purchase of a third B737-200QC in 1980, the airline’s network expanded to include Kuala Lumpur (1981), Darwin (1983) and Jakarta (1984). In 1986, following the acquisition of three new B757-200 aircraft, Taipei was added. Later, services were launched to Dubai (1988). Growth continued through the 1990s. In Jun-1990, Royal Brunei took delivery of its first B767-300ER aircraft, enabling it to operate to London Gatwick (1990). However, in May-2011, it changed its services to operate twice weekly to London Heathrow instead. In 1991, Perth and Jeddah added to its network while Brisbane came online in 1994. In Dec-1996, RBA launched daily service to London Heathrow. Twice-weekly services to Surabaya were launched a year later in 1997. In Oct-2003, Auckland was introduced to the network as an extension of the Brunei-Brisbane services and May-2006 witnessed the inauguration of the three times weekly flights to Ho Chi Minh City. Last year, the carrier relaunched direct services to Shanghai, with 2010 also marking the introduction of new B777-200ER equipment leased from Singapore Airlines deployed on the first commercial service from Bandar Seri Begawan to London via Dubai in June-2011. Melbourne is the most recent destination for RBA, following the launch of four times weekly service to the Australian city in Mar-2011. 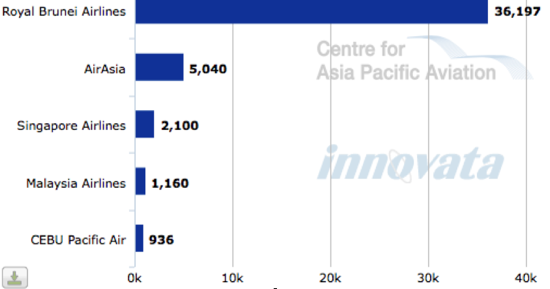 The carrier operates around 44,000 weekly seats, all internationally deployed, based on Innovata data for the first week of Aug-2011, of which around 41% is deployed in Southeast Asia. 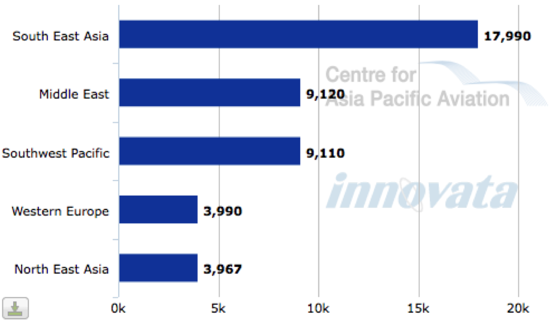 Around 21% of total capacity is deployed in the Middle East and Southwest Pacific, with around 9% of network capacity deployed to both Western Europe and North East Asia. 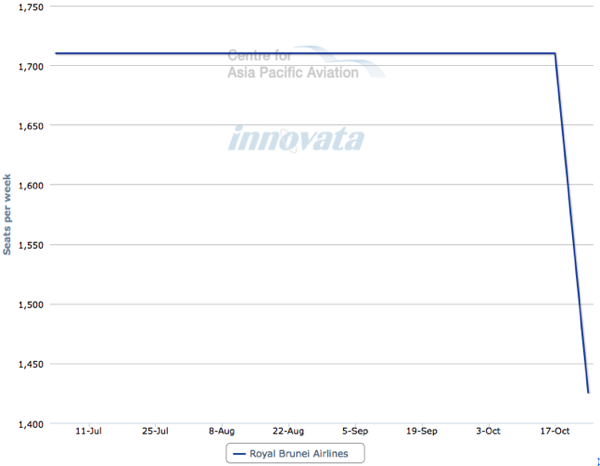 Royal Brunei has codeshare agreements with Thai Airways International, Malaysia Airlines, British Midland, Garuda Indonesia and Dragon Air. RBA, meanwhile, stated it would redouble its efforts to improve the customer service offering, starting with the entry into service of the long-awaited B787 in 2013. 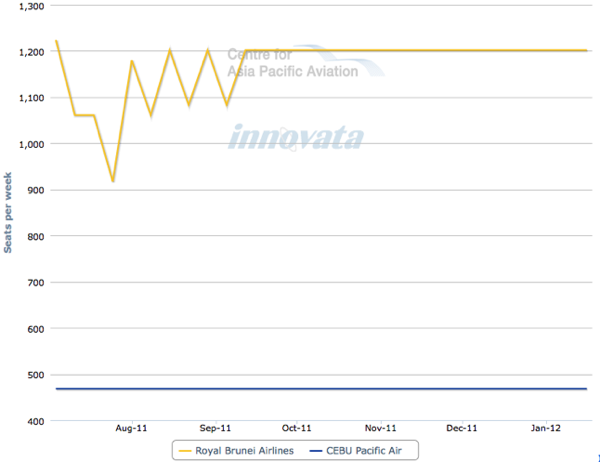 In addition, RBA is planning to add at least one extra A320 to its short-haul fleet in spring 2012 to ensure the airline can offer a more consistent schedule and level of service on the regional network. The carrier operates a fleet of two A320s at present. 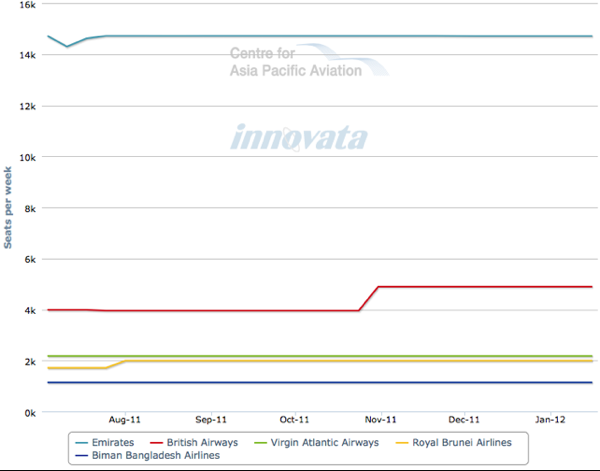 It remains uncertain whether the cutback of international operations will affect the lease of six B777-200ERs. 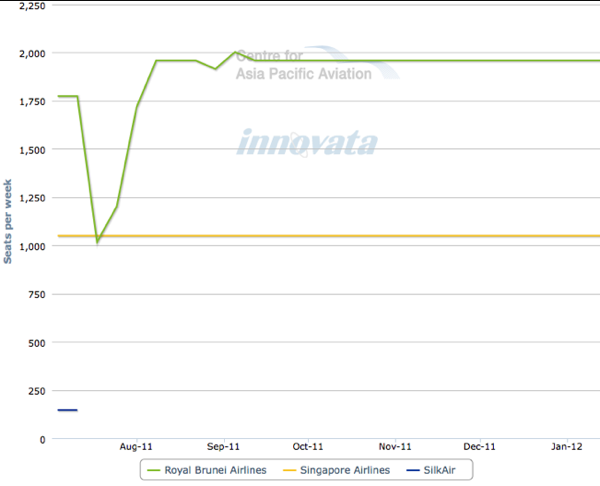 The carrier in Apr-2010 agreed to lease the six B777s from Singapore Airlines for a period of up to 2.5 years. RBA has also commenced the process of upgrading its passenger service system and the mechanism by which its customers can book travel online. The carrier has also implemented a programme to better respond to feed back from passengers and cabin crew.